Now follows the Śrī Hayagrīva Upanishad - the Vedic text dedicated to the Avatār or Embodiment of Lord Vishnu. Śrī Hayagriva is easily recognisable as an emanation with Horse’s head and Human’s body. 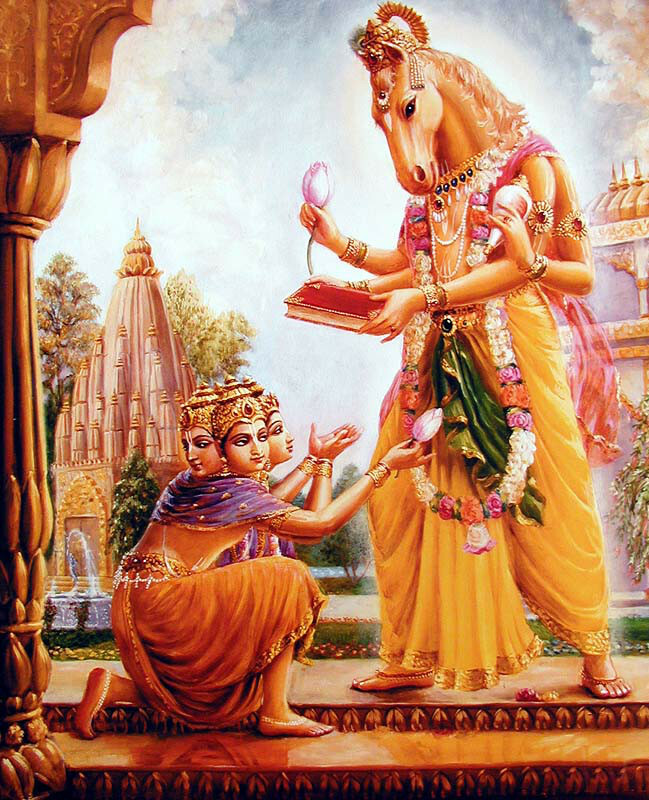 According to Vedic scriptures and Vaiṣṇava tradition Hayagriva is most often asked for knowledge, intelligence, success in studies and Vedic studies in particular. And yet, he is the full and legitimate incarnation of Lord Nārāyaṇa himself. auṁ bhadraṁ karṇebhiḥ śruṇuyāma devāḥ . svasti na indro vṛddhaśravāḥ . svasti naḥ pūṣā viśvavedāḥ . svasti nastārkṣyo ariṣṭanemiḥ . svasti no bṛhaspatirdadhātu ..
Once Nārada approached Brahma and said: O master, please teach me the best spiritual knowledge, knowledge that quickly removes all sins and brings spiritual glory and opulence. Hayagrīva-daivatyān mantrān yo veda sa śruti-smṛtītihāsa-purāṇāni veda . Brahma said: One who knows the mantras glorifying Lord Hayagriva already knows all the Śrutis, Smṛiti, Itihāsas, and Purāṇas. He becomes glorious with spiritual opulence. Here are these mantras: Obeisances to You, Lord Hayagriva, who are beyond the material world, and who are filled with spiritual bliss. Obeisances to Lord Vishnu, who is the monarch of all knowledge. mahāśva-śirase namaḥ svāhā svāhā namaḥ ..
Obeisances, obeisances to Lord Hayagriva, who has a horse's head. He is the Rig, Yajur, and Sāma Vedas, the duties of the Vedas, and the sacred syllable Om. sarvaṁ bodhaya bodhaya svāhā svāhā namaḥ ..
O inconceivable Lord who are hymns of the Vedas, the sacred syllable Om, the master of all eloquence, and all the Vedas personified, please enlighten me. Please enlighten me. I offer my respectful obeisances unto You. brahmātri-ravi-savitṛ-bhārgavā ṛṣayaḥ . gāyatrī-triṣṭub-anuṣṭup chandāṁsi . śrīmān hayagrīvaḥ paramātmā devateti . hlaum iti bījam . so'ham iti śaktiḥ . hlūm iti kīlakam . bhoga-mokṣayor viniyogaḥ . The sages are Brahma, Atri, Ravi, Sāvitrī, and Bhārgava. The meters are Gāyatrī, triṣṭub, and Anuṣṭup. The Deity is Lord Hayagrīva, the Supreme Personality of Godhead. The bīja is Hlaum. The śakti is So'ham. The Kīlaka is Hlūm. The viniyoga is enjoyment and liberation. The aṅga-Nyāsa is the letters a, u, and m.
We worship Lord Hayagriva, who is splendid like the moon, and who holds a conchshell, disc, mahā-mudra, and book in His four arms. oṁ śrīm iti dve akṣare . hlaum ity ekākṣaram . oṁ namo bhagavata iti saptākṣarāṇi . Om and Śrīm are two syllables. Om namo bhagavate is seven syllables. Mahyam medham prajñam is six syllables. Prayaccha svaha is five syllables. - This is the transcendental mantra of Lord Hayagriva. auṁ śrīm iti dve akṣare . hlaum ity ekākṣaram . aimaimaimiti trīṇyakṣarāṇi . klīṁ klīm iti dve akṣare . sauḥ saur iti dve akṣare . hrīm ity ekākṣaram . mahyaṁ medhāṁ prajñām iti ṣaḍakṣarāṇi . prayaccha svāheti pañcākṣarāṇi . pañcamo manur bhavati .. Aim Aim Aim are three syllables. Klīm klim is two syllables. Sauh sauh is two syllables. Mahyam medham prajnam is six syllables. This is the fifth mantra of Lord Hayagriva. hakāroṁ sakārom akāroṁ trayam eka-svarūpaṁ bhavati . bījānāṁ hayagrīvaikākṣara-bījam anuttamaṁ mantra-rājātmakaṁ bhavati . Now I will explain the single-syllable Hayagrīva mantra. Brahma taught this mantra to Śiva. Śiva taught it to Sankarṣaṇa, Sankarṣaṇa taught it to Nārada. Nārada taught it to Vyāsa, and Vyāsa taught it to the people. This single-syllable bīja-mantra is the word Hlaum, which consists of the three letters h, l, and oṁ. They who chant this Hlaum bīja-mantra attain both wealth and learning. They attain knowledge of the transcendental form of Lord Hayagriva and they also attain liberation, becoming free from the entanglement of residing in a material body. They become the rulers of the Dikpālas, kings, and nagas. Sūrya and others diligently chant this single-syllable Hayagriva mantra. Of all bīja-mantras, the single-syllable Hayagriva bīja-mantra is the best. It is the king of mantras. The syllable Hlaum is the transcendental form of Lord Hayagriva Himself. taj-jāpakānāṁ vāk-siddhiḥ śrī-siddhir aṣṭāṅga-yoga-siddhiś ca bhavati . Hlaum Amṛitaṁ Kurukuru Svāhā (Please make me immortal). They who chant this mantra attain eloquence, wealth, and the results of aṣṭāṅga-yoga. hlaum sakala-samrajyena siddhim kuru kuru svaha. (Please make me king of all lands). tan etan mantran yo veda apavitrah pavitro bhavati. abrahmacari su-brahmacari bhavati. dehī dehānte paramātmānaṁ praviśati . If he knows these mantras an impure person becomes pure, and a debauchee becomes a pure-hearted celibate. He is excused from his crimes. He is excused from killing a brāhmaṇa and committing a host of other sins. While he lives in this world he controls his body as the master of a house controls his house. At the time of death, when he leaves this body, he attains the company of the Supreme Personality of Godhead. pratipāditam arthaṁ ta ete mantrāḥ pratipādayanti . This mantra is manifested in two ways: as vowels and constants. yad vāg vadanty avicetanāni rāṣṭrī devānāṁ niṣasāda mandrā . catasra ūrjaṁ duduhe payāṁsi kvasvid asyāḥ paramaṁ jagāma ..
gaurīr mimāya salilāni takṣaty eka-padī dvi-padī sā catuṣ-padī . aṣṭāpadī nava-padī babhūvuṣī sahasrākṣarā parame vyoman ..
oṣṭhāpidhānā nakulī dantaiḥ parivṛtā paviḥ . sarvasyai vāca īśānā cāru mām iha vādayeti ca vāgrasaḥ ..
sa sarparīr amatiṁ bādhamāna bṛhan mimāya jamadagni-datta . āsūryasya duritā tanāna śravo deveṣv amṛtam ajuryam ..
mahā-puruṣo bhavati . sa jīvan-mukto bhavati . A person who on Ekādaśī recites these spiritual mantras becomes, by Lord Hayagrīva’s mercy, an exalted person. He becomes liberated even while living in this world. śrutaṁ mācyoḍhvaṁ mamāmuṣya om ity upaniṣat .. I offer my respectful obeisances to the Supreme Personality of Godhead. May I always remember Him. May nothing stop me from remembering Him. May I never forget what my ears have heard about Him.